Walk to the Gondola of the Best Ski Mountain in Colorado! Condo, 4 Bedrooms, 3 Baths, (Sleeps 8), first floor,large pool and hot tub. Ideal for skiing in winter or hiking, biking and relaxing in summer, our home is within walking distance of not only the slopes but shops, markets and many restaurants. The fabulous first floor unit is the largest in Snowflower and within 50 yards of the gondola and the kids ski school at the base of the ski mountain. Enjoy champagne powder skiing, one of the best ski school programs in the country and a kid/family friendly atmosphere. The outdoor hot tub is large and secluded and the outdoor pool is heated year round.There are picnic tables and BBQ grills for outdoor dining. A bus stop is located right across the street.The free bus runs to the shops, large grocery store and 'Old Town' every 20 minutes, eliminating any need for a car. The first floor corner unit is spacious and very comfortable. It is the nearest of the Snowflower units to the ski slopes. One of the master bedroom has a large walk-in closet with its own bath, a deck and a queen bed. A second master bedroom has its own bath, a large closet and a queen bed. Both baths have just been remodeled. Two other bedrooms share a bath and have two twin beds in each. One has a small deck and the other its own sink. The living room is large, sunny and has views of the ski mountain as well as a gas fireplace. There is a large deck out front. Contemporary, new living room furniture with a flat screen TV and stereo add to your pleasure.The dining area easily accommodates 10 and has a breakfast bar for four as well. The kitchen is well stocked and has every gadget one might wish for as well as cookie pans waiting to be filled! In addition to the BBQ grills right outside the door, there is a large, stone encased grill structure available for guest use by the heated pool with a fireplace on the side facing the pool. The pool area is fenced and the gate is locked requiring a key for access. Separate pool towels are provided. There are coin operated laundry facilities located in the building. The unit is wired and access is free. There is a computer available in the lobby. Keywords: Condominium, close to ski area, four bedrooms, sleeps eight. The incredible snow and challenging runs right outside the door of the condo are not to be missed. If one likes to ski, there is no better place to be. The closeness of the condo to the slopes cannot be beat.It is mere steps to the kids' ski school and to the gondola across a heated drive.There is a game system that can be set up for the children. In summer, the surrounding loveliness of the Colorado mountains hold everything one might want. Every outdoor activity which can be imagined is available. There is a newly remodeled bath in each of the master suites. The remaining two bedrooms share a Bath with an extra sink in one room. 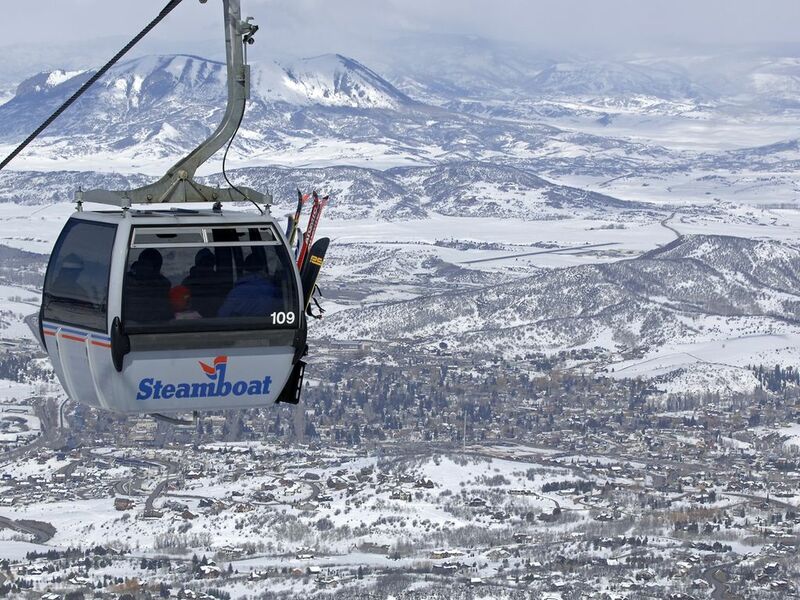 Steamboat is one of the finest ski resorts in North America. Voted best ski school in the USA. Dog sledding, night skiing and tubing, night dining on the mountain and child care are all available. There are many shops and restaurants on the mountain within easy walking distance. There is a small grocery store across the street. Free bus runs every 20 minutes to bigger grocery stores and town. Two bedrooms as well as the living room / dining room area have views of the ski mountain. Electric but the gas fireplace can handle most folks' needs. underground, permit required. Free with stay. Luxury towels , thick and thirsty. Large blue pool towels. In condo. Also a computer and free internet is available in the lobby area. Located in lobby. The condo is wired if one brings a personal computer. Cosy and comfortable with great views out the large windows. Gas fireplace. In garage, permit required. Available on site. Used to heat as well! Separate thermostat. Large with automatic ice maker. Large with cookie pans just waiting to be filled! Tea, coffee, filters, spices, Saran Wrap and time foil. Dishes for ten, glasses for use at pool and in condo, wine glasses, mugs. Filled with every utensil and gadget one might possibly need. Full sized, duel sink. Dining table seats ten. The breakfast bar seats four. Two, one in living room, one in one of the master suites. Usual cable, netflick hulu etc. available. Board games in shelf in living room. 'E' rated videos only are available in the condo for the niento 64. Two off the bedrooms and one facing the mountain off the living room. See above. Tubing and kayaking down the Yampa river a Steamboat classic. Gear available downtown. Two grills right outside the back door. A large grill is set into a beautiful stone area by the pool and is available for guests. Outside seats as well. Two separate decks, one wraparound from the main living area to one of the master suites. The other is off the third bedroom. Both face the mountain. Skiing right out the door! Access to the nearby indoor tennis courts available. Large enough for a kids’ party or multiple lap swimmers. Heated all year. Locked entry and fenced. Large, inviting, open until ten PM. Locked entry. Large heated pool and hot tub, all season outdoor grill, skiing right outside your door. Free bus to town runs every twenty minutes from across the street. Shopping and dining on the mountain. Great location, immaculately clean, well equipped. Will stay here again when we return to Steamboat. Loved the location that was a very short walk to Gondola and events in the square. Condo had everything we needed and Kids loved the pool/hot tub area. Would definitely return! Thanks so much Scott. We loved having you and are so glad the condo was perfect for your family. We work hard to try to think of everything our guests might need so it makes my heart glad to hear that you and your family were not lacking for anything. We would love to have you back! Everything was a should be and owner was very easy to work with. Steps from slopes! This was a great stay for the family over New Years. The condo is only a short walk to slopes and groceries across the street. Perfect location as you walk through then breezeway and out of hustle and bustle or can walk to all returuants, rentals and concerts at gondola square. Thanks for a great trip will be back soon. Second year with friends at Steamboat. This location offers great access to the gondola and bus line. All beds were comfortable. Owner was very helpful! We are coming back to this location in the future! Location, location, location -- LOCATION! I ski at Steamboat often. This property has the best location available at the resort. This older building has just undergone a major exterior remodel. Now, it looks like as though it was built last season. The interior of the unit is well-appointed and recently updated. The walk from the front door of the condo to the gondola and Ski Town Square (base area) couldn't be more than 200 yards. This is TRUE ski-in/ski-out. You can go home for lunch if you want. It doesn't get any better than this. The facility has ample, underground parking and a pleasant, heated outdoor pool and spa. I found the spa to be hotter than usual - a nice surprise after skiing. The floor plan is unique. The four bedrooms are each positioned on opposite corners - affording maximum quiet and privacy. With seven adults staying; it never felt crowded and only two shared a bed. Finally, this property is owned by the original owner. She is friendly, easy to work with and accommodating. This is an ideal location for a no-hassle ski vacation. I hope to stay here again soon. I recommend it with no reservations! Discounts on ski tickets are available if purchased seven or more days in advance from the ski corp online. We also offer a 20% discount on skis/snowboard rentals. Airport pickup/drop off is available for up to seven people for $75 one way.